DERMAdoctor Picture Porefect - Let's face it, men have it easy! Sometimes I really do wonder....... Pores are ok for men to have but not so for us women. Large pores can be a burden and trying to shrink them can be quite difficult. Large pores are caused by genetics and age. I know I know, lovely right! When pores are get clogged with unwanted stuff, they tend to expand. The truth is, you can't shrink large pores but you can reduce the appearance of them. DERMAdoctor has come out with a pore minimizing solution to help. 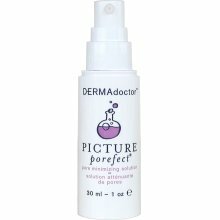 Picture Porefect removes unwanted oils, blackheads, and smooths the edges of the pore! Really anyone who needs to minimize the appearance of their pores. Awesome for oily and acne prone skin. 2. Apply Picture Porefect on entire face. Aqua (Water), Butylene Glycol, Glycolic Acid, Sodium Glycolate, Azelaic Acid, Lactic Acid, Citric Acid, Tartaric Acid, Camellia Oleifera (Green Tree) Leaf Extract, Salix Nigra (Willow Bark) Extract, Polysorbate 20, Aluminum Zirconium Tetrachlorohydrex Glycine, Cyclopentasiloxane, Retinol, Glycerin, Hydroxyethylcellulose, Xanthan Gum, Acrylates Copolymer, Phenoxyethanol, Butylparaben, Ethylparaben, Methylparaben, Propylparaben, Polyacrylamide, C13-14 Isoparaffin, Laureth-7. "I thought it worked immedietly. I only tired a sample pouch, will purchase the full size bottle." "Did nothing for me. I had high hopes because of the reviews." "It feels like I have tried everything, and finally I found a product that works for me." Clinically proven to reduce pore size! Eliminate blackheads and airbrush your pores to ?porefection. ?